Thomas and Li-Ming were both eagerly waiting to catch a glimpse of Gillette Castle. The 11-year-olds were sitting together aboard the riverboat Becky Thatcher along with the nineteen other students in Mr. Espinoza’s sixth grade class. The group had just embarked from Deep River Landing to study the Connecticut River. But Li-Ming and Thomas, best friends since kindergarten, had their eyes on the land to the right—or starboard—side of the boat and were scanning the yellow, scarlet, and russet foliage for the silhouette of a rough stone castle. Perched on a stool, facing them, was their guide, a white-haired man named Norm who was speaking into a microphone. He knew the landmarks so well that he could point to them without looking. Li-Ming and Thomas were supposed to be taking notes, and they were aware of Mr. Espinoza standing behind them, keeping his sharp eyes on the class. But what Mr. Espinoza couldn’t see was what Li-Ming and Thomas had written—or rather drawn—in their notebooks. Thomas glanced over at Li-Ming’s sketch of a castle, complete with detailed blueprints of rooms, and then back at his own drawing of a deerstalker hat and pipe. “In a minute, if you look two hundred feet up on the ridge to the right, you’ll spot Gillette Castle,” Norm finally said. Thomas and Li-Ming strained forward, waiting. “Who can tell me who William Gillette was?” Norm continued. Thomas started to raise his hand, but Samantha’s hand rocketed straight up. As usual, she was sitting in the very front and had all the answers. Li-Ming almost never volunteered to speak up, although she knew all the answers, too. “Yes, young lady?” Norm said, calling on Samantha. “He was a famous actor who played Sherlock Holmes and built a castle,” Samantha replied. This was exactly what Thomas wanted to hear. Not only was he a Sherlock Holmes buff, but he also planned to become a detective. He was eager to solve serious crimes like his Aunt Rose did as a state police detective, but so far, the only mysteries Thomas had solved were minor and domestic. Who had eaten all the Snickers bars in his Halloween candy last year? His little brother Henry. Who had knocked the glass of milk off the kitchen counter? The family cat, Basil. Thomas wanted to apply his sleuthing skills to a real mystery. 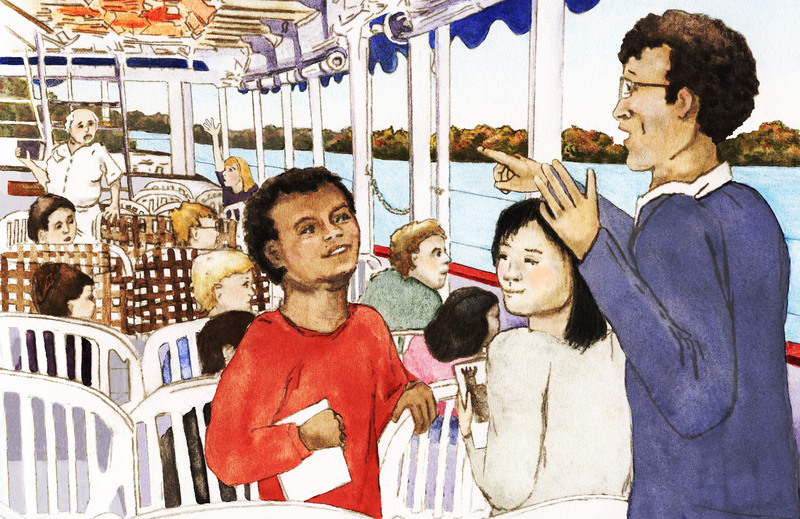 All the students peered expectantly at the riverbank, while Norm, still facing them, kept talking. Li-Ming’s eyes shone with delight. Her dream was to become an architect. Every chance she got, she designed buildings—sometimes even right on her field trip notes or math homework! “Take a good look,” Norm prompted.The students stared up at the empty ridge. Mr. Espinoza stepped forward, looking puzzled. Norm finally turned to take a look himself. And when he did, his face turned as white as his hair. Who are the main characters introduced in chapter 1? What do we know about them? Why are they on the Connecticut River? Why are they so interested in Gillette Castle? What dreams do Thomas and Li-Ming possess? What does Li-Ming dream about being when she grows up? What profession is Thomas aspiring to have? What do your students want to be when they grow up? Li-Ming draws blueprints and Thomas solves household mysteries. Do your students do things related to the careers they hope to have one day? Chapter 1 ends with a cliffhanger. Talk a little bit about the meaning of cliffhangers. There is a dilemma and our authors hope they have left you in suspense. Samantha lets Norm know that the landmark he is describing, Gillette Castle, is not where he says it is. When Norm looks up the ridge his faces turns “as white as his hair.” How does this ending make you feel? What do you think might happen next?